Do you ever feel like you just want something sweet but you only want a bite? I’m always trying to eat healthy, whole food avoiding candy and sweets. Despite that I love baking and making sweets to give away. Planning to give them away ensures I don’t eat them all. That would not be a good plan. Generally, for breakfast I eat oatmeal with fruit, ground flax and cinnamon. 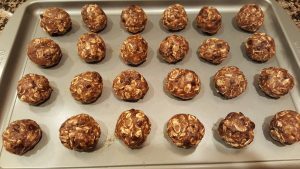 Recently I bought some ground flax at Trader Joe’s and every morning I would look at the bag and read this recipe for “Energy Bites”. Eventually I decided I had to find a way to make them. The original recipe used peanut butter so I needed to find a good substitute. Looking in my pantry I found an unopened jar of sunflower butter. Hmm… I wondered if this would work in place of the peanut butter? 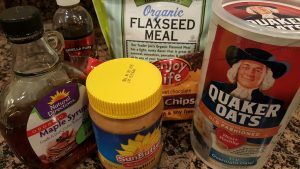 Using the following ingredients, I made my own version of the Trader Joe’s Energy Bites. They are vegan, gluten-free, nut-free and delicious. Although it would be easy to eat them all, I consider them a treat so no more than 1 or 2 at a time. An even better idea is to share them so I can’t eat too many. The SunButter sunflower butter needs to be on the thin side. You’ll find that it’s thicker at the bottom. One trick is to heat it in the microwave gently or put the jar into a bowl of hot water. Then you can mix the butter and it should be easy to stir. I like to use Enjoy Life mini chocolate chips for this recipe. They are just the right size and easy to work with. First, gather all your ingredients. Get a medium sized bowl and a metal pan that fits on your freezer shelf. Make some room in your freezer for the pan. Measure and pour all the ingredients into the bowl. Use a spatula to mix everything together well. Wet your hands. You’ll need to keep your hands a little moist so it might be good to be near the sink. Using a tablespoon scoop out a little of the mixture and roll it between your hands into a small 1” ball. Place the ball on the pan. Continue until you’ve used up all the mixture. I got 24 bites out of mine. Place the pan in the freezer. When ready to eat, take out of freezer and let sit for 5 minutes. This avoids breaking any teeth. Simple, quick dessert that’s gluten-free, nut-free and vegan. Measure about 1 Tbsp of mixture into hands. Roll mixture into a ball and place on pan. Freeze at least an hour to set. Recommend keeping in freezer until ready to eat.